Norway wants to be seen as a progressive leader on oceans, environmental issues and in the Arctic. But continued oil drilling has overshadowed those efforts. This year, like last year, an astounding number of Norwegian government ministers descended on Tromsø, the main city in Arctic Norway for the annual Arctic Frontiers conference designed to bring Arctic science and politics together. Erna Solberg, the prime minister, only cancelled her appearance at the last instant because of a government reshuffle. Norway often repeats for public consumption how it takes its Arctic regions and its Arctic politics seriously. 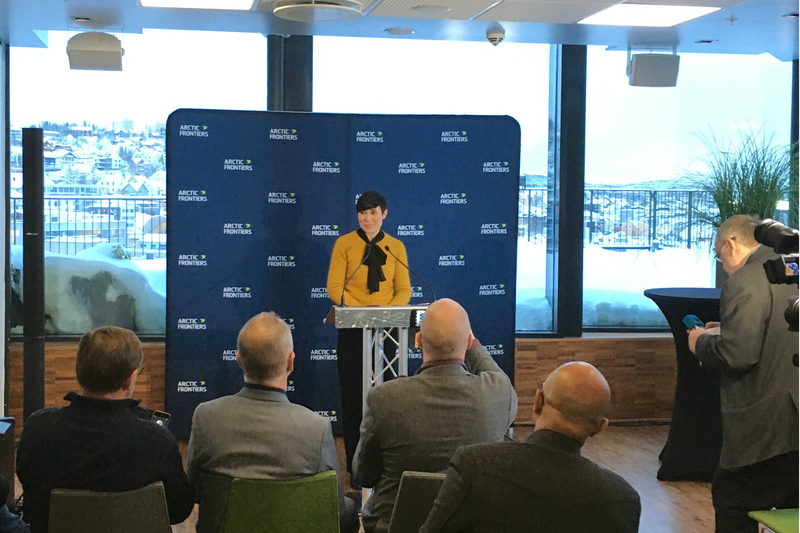 Foreign minister Ine Eriksen Søreide re-iterated more than once in Tromsø how the Arctic is the most strategically important item on Norway’s foreign policy agenda. Which is why it must be almost painfully irritating to Norwegian politicians that so many of Norway’s Arctic initiatives — ostensibly constructed as progressive efforts to protect the environment, benefit of the marine mammals, limit carbon dioxide emissions to fight climate change and fight for the well-being of the Arctic Indigenous communities — are so often questioned and cast in doubt because they come hand-in-hand with Norway’s open admission that it wants to drill for still more oil. This continued claim that Norway can be very, very green and still drill for more oil clearly enrages many environmentalists (and others) both at home and abroad. At the conference last week in Tromsø, Ine Eriksen Søreide, Norway’s environmental minister Ola Elvestuen, three other government ministers and several high-ranking civil servants encountered a barrage of questions about Norway’s steadfast steps to allow still more oil drilling in the Norwegian Sea and in the Arctic Ocean’s Barents Sea — and especially in sectors previously deemed too environmentally sensitive, too close to the edge of the polar sea ice, too dangerous and therefore off-limits for even the most sophisticated oil-rigs. At a point during the second day of the conference and to the delight of the large international audience, conference moderator Stephen Sackur of BBC’s HardTalk treated the Norwegian government’s Special Representative to the Oceans, Vidar Helgesen, to a series of on-stage interruptions of the “I want a yes-or-no-answer”-kind. This painted in effect Mr. Helgesen, who refused — and by association his political employers in Oslo — as less than trustworthy, should he make any further claims to be a friend of anything other than black oil. Spontaneous applause flowed from the floor and few probably remember the answer which Helgesen was finally allowed. Vidar Helgesen’s appointment as Special Representative to the Ocean, a newly invented cog in Norway’s diplomatic machinery, is in itself a telling sign of Norway’s national ambition. Helgesen, a conservative like prime minister Solberg, twice served as a government minister, first for Norway’s European affairs and more recently for environment and climate. He is now tasked with making sure, basically, that Norway’s new strategy to harvest still more of the ocean’s ressources, including oil, is understood and accepted as sustainable by the rest of the world and that more nations pursue a Norwegian-like path towards the oceans. Norway has for a couple of years strived to be at the front of global thinking on the future of marine oil and gas, fisheries, aquaculture, sub-sea minerals, cargo-shipping, Arctic tourism and still-to-be-discovered cold-water bio-techs, enzymes and other riches from the seas. Woven into the Tromsø-conference was a strong focus on marine plastic litter in the Arctic; a subject tightly connected to Norway’s ocean approach. At a press briefing only two hours into the conference Ine Eriksen Søreide shared her own plastic frustration: “The debate changed completely two years ago, when we had a whale that came ashore, its belly full of plastic bags. Everyone realized that this was something the whale had gotten into its stomach on its long travels. It brought to our attention that many of the countries that are most affected by marine litter do not produce that litter themselves,” she said. From this year, Herzke is among the coordinators of a multidisciplinary research program on plastic marine litter involving several Norwegian institutions, including the University of Tromsø – Norway’s Arctic University. With intense political focus already on the subject, funding should not be a major problem. At a strictly science-oriented event, Dr. Ilka Peeken, a sea-ice ecologist from Germany’s Alfred Wegener Institute’s Helmholtz Center for Polar and Marine Research in Bremerhaven managed to disturb me with a new scientific theory. Marine plastic pollution, much of it garbage from the Asia-Pacific but also from Europe, is carried by ocean currents up through the Bering Strait between Russia and the US or from Europe up through the North Atlantic straits, but scientists are also increasingly detecting microscopic plastic particles brought to the Arctic by long-range winds. “We can basically follow this concentration of plastic from the atmosphere down through the ice, through the water column and to the sediments on the ocean floor. And don’t forget this is in the Arctic which is already under threat from significant climate change,“ Dr. Peeken told me. During cruises with Polarstern, a research vessel of the Alfred Wegener Institute, Peeken and her colleagues drilled cores from ice-floes, some originating as far north as the Makarov Basin in the central part of the Arctic Ocean close to the North Pole. These cores contained “an extremely high number” of microplastic particles, Peeken said. She stressed that this was her personal theory, not proven by any substantive studies. She and others told me how the scientists still have far more questions than answers about plastics in the Arctic. Finally, Peeken took pains to uphold my sense of proportion, reminding me that climate change will most likely have a much more profound effect on the Arctic than plastics.